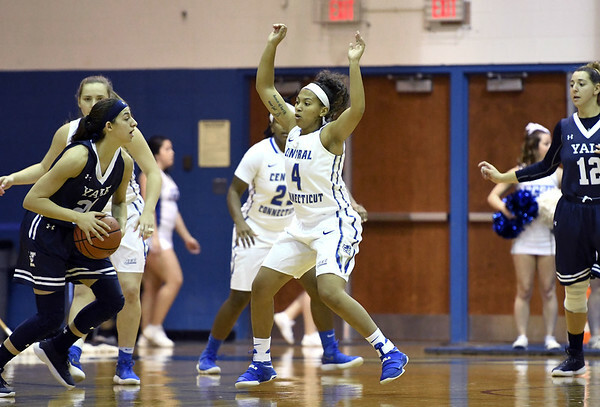 The Central Connecticut women's basketball team picked up its second win of the season, snapping a two-game Sacred Heart win streak Saturday afternoon 69-59. In its best overall team performance of the year, the Blue Devils hit 24-of-54 (.444) including a 9-for-19 (.474) effort from behind the arc. CCSU junior Kiana Patterson led the Blue Devils with 20 points and three assists. Patterson shot 5-of-11, 4-of-7 from three, and 9-of-10 from the foul line. The co-captain sank 7-of-8 free throws down the fourth quarter stretch to seal the win for CCSU. Freshman Emma McCamus also scored 10 points on the day. Back-to-back three's from senior Morgan Johnson and McCamus sparked an 8-0 CCSU run taking a 10-4 lead with 3:52 to go in the first quarter. The rookie from Cavan, Ontario proceeded to knock down another triple and convert the old-fashioned three-point play to score nine points in the opening period. Central held an 18-16 edge heading into the second quarter. Junior Andi Lydon started the second quarter with a three-pointer and then scored seven points to grow the Blue Devils' largest lead of the first half (eight points) 34-26 with .54 seconds left before the halftime break. Central Connecticut ended the first 20 minutes of action ahead by six points, 34-28, its largest halftime lead of the season. CCSU out-shot and out-rebounded Sacred Heart in the first half. Midway through the third quarter Patterson, knocked down two three-pointers and then drained a pair of free-throws to extend CCSU's lead to the largest of the game of 11 points at 44-35. With 4.4 seconds on the clock, junior Sydney Hines inbounded the ball on the far sideline to Patterson who went right back to Hines for a buzzer-beater three to give CCSU a 49-36 lead heading into the final period. Sacred Heart's leading scorer, Katherine Haines struck the back of the net first in the fourth, leading to a 4-0 Pioneers run that was snuffed by CCSU's ninth three-pointer of the game. Junior Sydney Hines made three pivotal plays to help the Blue Devils take a 16-point lead late in the fourth, including a three-pointer, a drop-pass to freshman Ashley Berube for a lay-in and took an offensive charge on a Pioneer fast break. SHU would not go down without a fight as they out-scored Central 14-8 in the final two minutes of the game cutting the deficit to seven. Sacred Heart had three players score in double figures paced by Katherine Haines with 19 points. Berube had her best all-around performance of the year with a game-high nine rebounds, eight points and four blocks. The Blue Devils will next travel to Teaneck, NJ to face the Fairleigh Dickinson on Monday, January 15 at 5:00 p.m.
Posted in New Britain Herald, CCSU on Saturday, 13 January 2018 20:30. Updated: Saturday, 13 January 2018 20:32.